If you had ordered 100/20 and were getting 5/1 or 20/2 or something, then you have something to be worried about. So... Under what conditions do you think you shoudl be able to get theoretical max throughput? If TCP, what stacks? What packet sizes? What latency to the end server is acceptable to get max speed? If speedtest.net, do you understand how the value is calculated and put on screen? Should you get max speed 24*7 or is it acceptable to have 90 minutes a day when you only get 95% of the max speed? Do you require max speed on a single thread, or if it can be achieved on multiple threads is that acceptable? sbiddle: Are you sure your devices are both negotiating at FE or Gigabit? You haven't answered this yet. Yes, confirmed by ethtool that the NIC at the time was running at 1Gbps. I suspect that those getting real-world 100Mbps are not on Chorus like I am. Unlike DSL there are no environmental factors, so there is no excuse. I've posted here on Geekzone because I wanted to establish if I had made any mistakes with my assumptions or testing first before calling Snap. If Snap advertised this as 90/20 I would have no problem. But they haven't. Oddly I can get my upload fine, only download is affected. 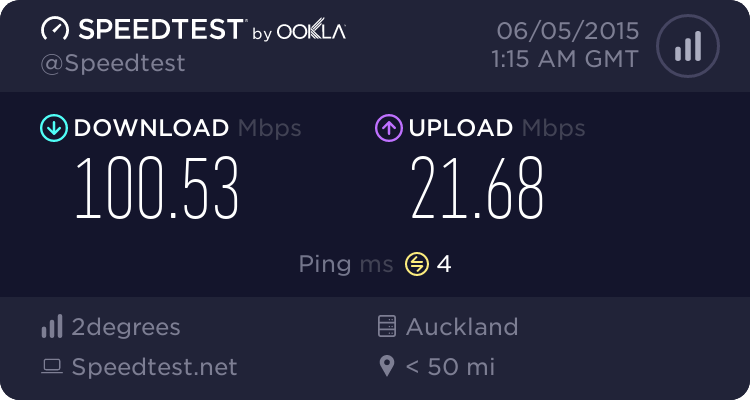 I suspect that I am on the old under-performing Chorus 100/50 service (despite being a new install), which Snap have engineered the upload in their systems to cap at 20Mbps. Can you PM me your Snap username so I can look into this for you. out of interest, what speeds would you be getting in typical real world downloads ? PM sent. I'm happy to work through this with you. Its entirely possible it could be a provisioning fault. I dont think its a fault, its a choice - all 4 Chrous/Snap 100mbit UFB plan ive setup, none can get up to 100mbit, all about same as your results. there was some posts on here a while back that did explained chorus provisioned it this way, 100mbit at layer 2, but for the 200mbit plans its "over provisioned" so customers can actually get the advertised speeds of 200/20 or 200/200. bongojona: out of interest, what speeds would you be getting in typical real world downloads ? This is a difficult question to answer, as it depends very much on how you use your connection and to some extent how you define "real world" usage. I generally consider anything over 8Mbs^-1 to be good, as I download quite a bit from file hosting sites, and they aren't exactly fast. Even with half a dozen concurrent downloads, I won't see anything like 100Mbs^-1, and other interactive usage won't be harmed in the slightest. Downloads from well-connected sites (popular software in my case), often occur at around 30Mbs^-1. Most real world usage isn't downloading multi-gigabyte ISO files from local content mirrors. In those cases, yes, you absolutely can exceed 100Mbs^1, although I'd say the sustained speeds would still typically be in the region of 100Mbs^-1 at best. I tend not to include local mirrored content as "real world", given only a tiny amount of data comes from local sources. In those cases however, I have seen ISO downloads in excess of 20MBs^-1 (160Mbs^-1). I can confirm that the full 100/20Mbps is very doable on Snap. Here's a result from a test I did at a friend's house with my router + laptop. Connection between the router + ONT, as well as the connection between the router and laptop were running at 1Gbit/s. 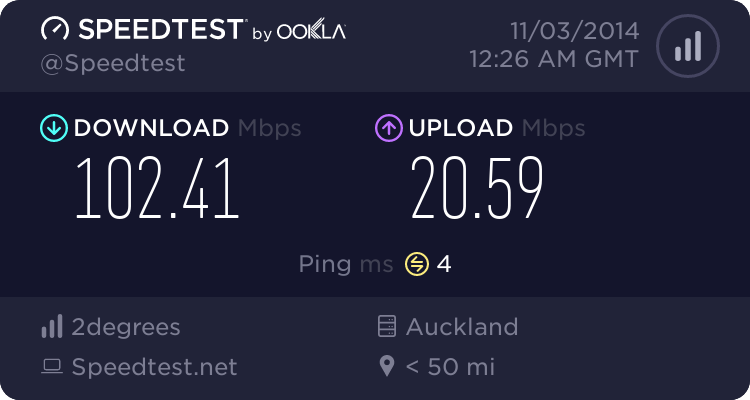 They're on Snap's 100/20Mbps plan, in Auckland with a Chorus ONT. I'm on the Snap 100/20 plan with Chorus and can get over 100Mbs on local speedtest sites (over wireless too), so, Snap do have connections on the right performing plans. Lorenceo: I can confirm that the full 100/20Mbps is very doable on Snap. Thanks, this is why Geekzone is awesome. I suspect there is a fault with my provisioning now. Does anyone have specs for the newer right-performing Chorus products? With a trailing wind, downhill, large packets, low latency, multiple threads, generally not real world at all, and most likely measured using the estimate from speedtest.net. Estimate. A big thanks to RalphFromSnap who reached out and got this fixed very quickly. Speed test is perfect now, and I have no complaints. I'd be interested to know what was causing this. If anyone else has a similar problem on Snap+Chorus, it can be fixed - just get in touch with Snap.